Apollo 11 Astronaut Buzz Aldrin, lunar module pilot, is shown here after deploying the Early Apollo Scientific Experiments Package. In the foreground is the Passive Seismic Experiment Package; beyond it is the Laser Ranging Retro-Reflector. A new look at old data spotlights how rocket landings and departures on the Moon can impact equipment. Thefirst astronauts to walk on the moon in the 1960s and 1970s were inundated bysticky lunar dust that clung to their spacesuits whenever they venturedoutside. 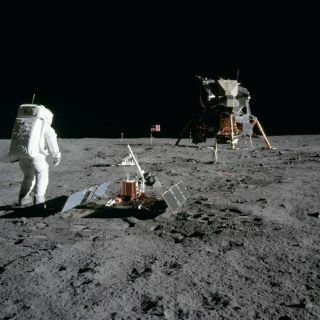 Now, fourdecades later, a self-funded study by an Australian physicist has found a linkbetween the dust's stickiness and the angle of the sun at the time of eachmoonwalk. Thenew research, which drew on the personal files and paper charts of physicist Brian O?Brien of Perth, suggests thatfuture lunar astronauts may have greater problems with dustadhesion in the middle half of the day than NASA?s Apollo missions faced in theearly morning. ?Dust isthe number one environmentalhazard on the moon, yet its movements and adhesive properties are littleunderstood,? saidO?Brien, who was the principal investigator for the Dust Detector Experiment on several Apollo lunarlanding missions between 1969 and 1970. His new research will be detailed in the Geophysical Research Letters. The new studypoints out that the electrostatic adhesive forces of dust decreases as sunlighton the moon decreases. Furthermore, O?Brien believes that some sort of lunarshack foron-duty moonwalkers may be mandatory to provide for a sunlight-thwarting,dust-free working environment. ?It followsthat on future lunar expeditions, powerful electrostatic adhesion of lunar dustduring the middle half of each lunar day could cause greater dust problems thanexperienced by Apollo astronauts,? he relates. This model byO?Brien infers that Apollo astronaut problemsfrom clinging dust, at solar elevations much less than 45 degrees, may havebeen driven by other forces. Mechanical bonding properties intrinsic to lunardust, he suggests, could explain partial success by moonwalkers in sheddinggear of dust with ?moon brushes.? Invented byO?Brien, the matchbox-sized detectors for the DDE study were planted onthe moon during the Apollo 11, 12, 14 and 15 missions. O?Brien carriedout that work while serving as a professor of space science at Rice Universityin Houston, Texas, from 1963 to 1968. O?Brienwas one of seven scientists chosen by NASA from 90 applicants to providesophisticated instruments in remote scientific stations deployed by Apolloastronauts. While another of his projects, the Charged Particle LunarEnvironment Experiment, was lost on Apollo 13, it was deployed during theApollo 14 moon landing mission. It turnsout that NASA had misplaced its computer tapes of the experimental data butO?Brien preserved his copies. ?I started to revisit thepersonal Dust Detector Experiment (DDE) data in 2007 after learning in late2006 that the sole source of data was with me,? he told SPACE.com. In anotherfinding by O?Brien, Apollo 11?s DDE made the first measurements suggesting thatrocket exhaust caused significant contamination of deployed equipment. Apollo 11?s dustdetectors, O?Brien said, showed the impact of rocket exhaust spit out from thedeparture of the Eagle lunar module's ascent stage. This stage was the home,hotel and vehicle back into lunar orbit for Neil Armstrong and Buzz Aldrin, anda key step in returning them to home planet Earth. Eagle?sliftoff from Tranquility Base caused quite a stir, environmentally speaking. Therewas significant contamination of astronaut-deployed hardware by kicked-uplunar material. So much so that the spray of debris caused by the departingrocket motor led to the overheating and early failure of Apollo 11?s PassiveSeismic Experiment - the first major scientific experiment put on the moon byhuman hands. A lessonlearned here is where best to place equipment given future landings andtakeoffs of moon vehicles. For Apollo 11?s DDE, it was deployed roughly 55 feet(17 meters) away from the Eagle lander. ?Such damagewas a foreseen possibility? accepted on this first mission in interests ofastronaut safety. These benchmark measurements on the moon appear unused andunreferenced in theoretical modeling of effects of rocket exhausts,? O?Brienexplains. ConsideringNASA?s plan to return humans to the lunar surface for longer stints, there?sanother lesson underscored by O?Brien?s work. That is, the need to betterpreserve, dust off, and revisit Apollo data. Doing so canteach moonwalkers new tricks to live and work on the old moon.